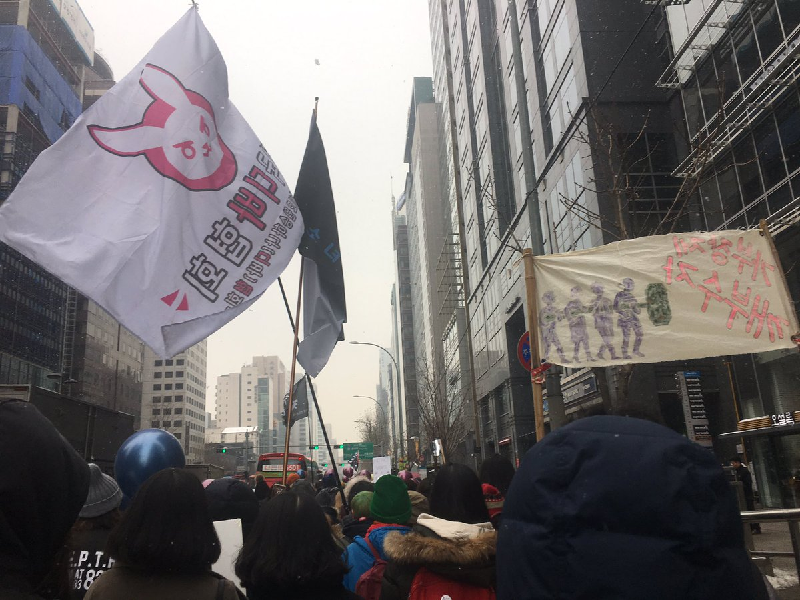 Women marching earlier today in Seoul with a flag or D.Va’s bunny symbol, via @marchseoul. Unless you’re living under a rock, you probably noticed the Women’s Marches going on all over the world this weekend. The political protest is home to all sorts of people, messages, and signage, including from Blizzard’s Overwatch. The above image, which came by way of the Twitter account for the Women’s March in Seoul, shows someone brandishing a flag adorned with mech pilot D.Va’s bunny symbol. It makes sense since the character’s real name is Hana Song and hails from South Korea. Known for shredding enemies from inside her two-legged tank, the bunny face from the flag above is the same one D.Va spray paints around the in-game battlefield. As a character, D.Va is more or less a collage of different mecha anime archetypes, with clear links to series like Neon Genesis Evangelion and Appleseed. But long before her bunny face became associated with the global women-led marches against oppression, it was largely thought to have been borrowed from, or at least inspired by, much shittier source material like Sucker Punch. The bunny mech in that movie is also used to wreck proto-fascists, although the rest of the film is a total cluster on too many levels to describe. While the designs for some of Overwatch’s women characters have come under fire in the past, the game’s representations have also earned it some praise. And as the march above demonstrates, least some people see characters like D.Va as symbols of empowerment more generally. Since online multiplayer games like Overwatch are inherently social and interactive, it’s not surprising to see emblems from inside the game be used as rallying calls in real life.